Security has been stepped up around the transport network in London, after a man was arrested over the discovery of a suspect device on a Tube train. 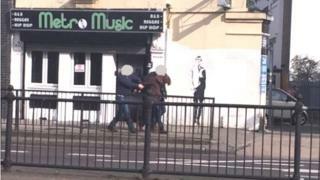 The 19-year-old suspect was detained by armed police on Friday afternoon in Holloway Road, north London. A Taser was discharged during the arrest. A controlled explosion was carried out on the suspicious item at North Greenwich station on Thursday morning. The suspect was taken to a London police station and is still in custody. Scotland Yard said the device was due to be forensically examined. Passengers have been told to expect to see more officers, including armed police, in and around transport hubs, while patrols by British Transport Police are in place on the Underground and at railway stations. A witness to the teenager's arrest described him as white, bearded and wearing a hoodie. Ali, aged 30, who did not give his full name, said the man had been walking along the street "normally" when police descended. "The armed police, I think five of them, ran behind him and put him on the floor," he said. "They were shouting 'armed police, don't struggle'. Everything happened so quick." The suspicious object was discovered on an eastbound Jubilee Line train at the south-east London station at about 11:00 BST. A source told the BBC the device was found by a member of the public and handed to a Tube driver. The driver treated it as a suspicious and said it contained "wires and possibly a clock". The station was evacuated and members of the Met's bomb squad carried out the explosion, after the item was described as looking "real enough". The Met said officers were keeping an open mind regarding any possible motive but said they were not looking for anyone else in relation to their investigation at this stage.